This is a quick blog post on 10 Things to Know Before Coloring Your Hair. We all know how costly it is to have our hair colored professionally. With the vast selection of available boxed hair dyes its too hard to resist on not doing the coloring yourself! 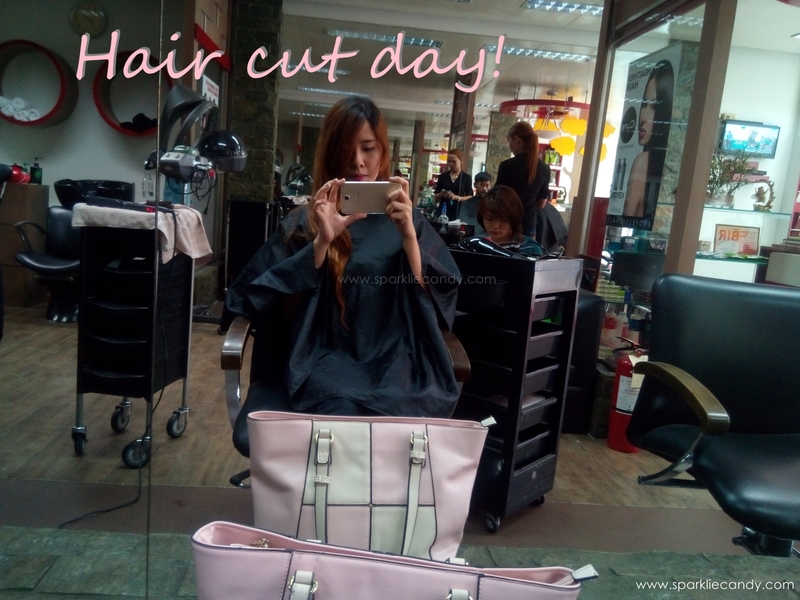 Here is behind the scenes (lol) when my friend went with me to the salon so I can finally have my hair cut after 2 years! It'll be great if you tag a friend with you. Typically its 2-3 boxes for long hair or more and 1-2 boxes for short hair. Depends on the length and thickness the number of boxes needed varies. But as a general rule, get more than enough for your hair. You wouldn't want to have less especially when you are half way finish. If going for a lighter shade compared to your desired color you must go for 2-3 shades lighter for the hair dye. Its most likely that the end result won't be similar to the shade in the box anyway. Asians usually have this black hair and lifting the color can be quite a feat. It is easier to darken the color's intensity than to lighten it when the dye is already in your strands. I often use 12% volume developer when lightening hair color, but just recently I used 9% because I would be coloring my blonde hair and less volume means the mix will be less damaging. I usually go for tube hair dyes but I find that there are a lot of formulas right now. If you are really doing DIY color on your own foam dyes in bottle like Palty. Most japanese and korean brands also offers bubble formula which is easier to handle because there is no mixing involved. Also, such formula is thick and more likely to stay on you hair than you skin. No dripping on your face or hairline.Cream formulas in tube however is proven to provide full coverage when evenly distributed to the hair. Some hair dyes nowadays have little to no ammonia smell at all. If you can, choose ammonia free hair dyes. I have a friend who just had a blonde hair, he swam in the pool and got moss green hair. Chlorine strips away the hair cuticle allowing minerals in the water to get into the hair shaft and alter your color. Unfortunately during the first 2 weeks of coloring your hair you may not dive in the pool. Just a bit of sacrifice for being extra pretty. Dirty hair is best when dyeing. Forget shower prior to hair dyeing in order to allow the scalp's natural oils to work as buffer against the chemicals in the hair dye. Can't skip the showers? Skip shampoo instead. 6. CHANGE YOUR HAIR BUDDIES! Clarifying and dandruff shampoo can easily strip away not just the color but even your hair's shine and oil. There are colored hair friendly formulas which are more gentle for our crowning glory. For me, red hair is the most difficult color to maintain. No matter how much promises your box of dye offer there will still be damage. This is still true even when you want to darken your hair. Both of permanent and semi-permanent dyes contains hydrogen peroxides which lifts or changes the color. Deep conditioner or hair spa can replace moisture lost during the coloring process. But its better to have healthy hair even before the process. Chop off split ends if you can. Buy conditioner, lots of it! Hair spa will be wonderful. Your hair will thank you. I am one of the lucky ones who didn't experienced irritation when coloring. However I know some of us are sensitive on chemicals, therefore do not forget to patch test a small area on your hair before coloring. Your scalp will be irritated as well if you color without knowing if the dye is something you can tolerate. I am guilty of dyeing my whole head every time I color. My bad, I didn't know I must only color the regrowth. Doing too much coloring will result to color build up and fried ends. It will also be the cause of uneven colors as well as unnecessary damage.